My life is returning to normal and I figured it was time to start our fairy tales back up!! 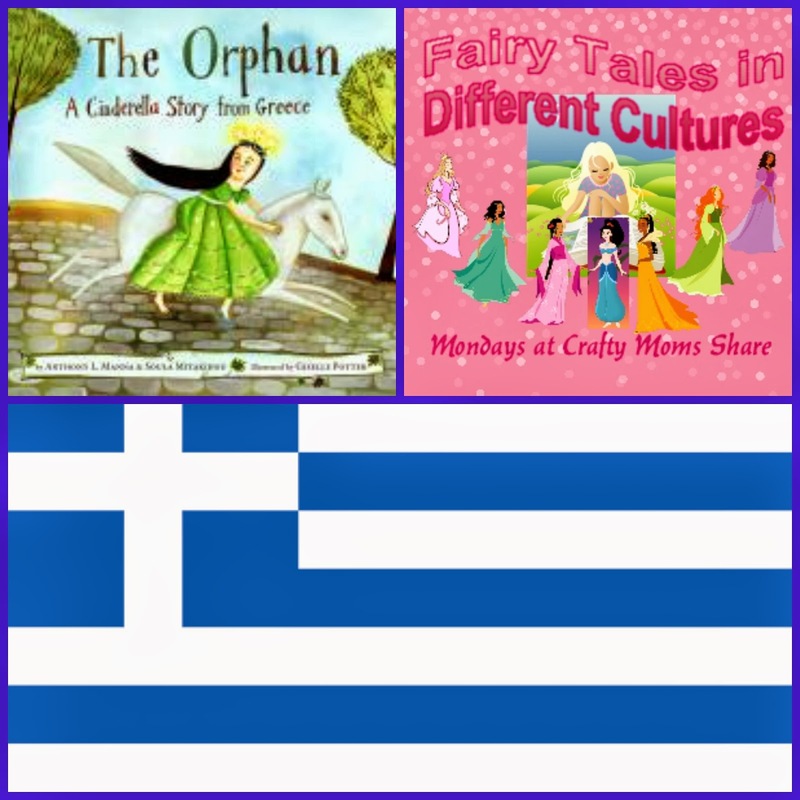 Today we are sharing a version of Cinderella from Greece. This is a wonderful story to share, but first a bit about Greece. 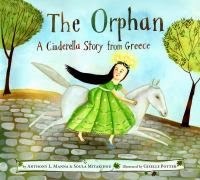 The Orphan: A Cinderella Story from Greece by Anthony Manna and Christodoula Mitakidou is a wonderful Cinderella tale, however you do not learn much about the Greek culture by reading it. The only thing I learned about Greece is that when you lose a mother you are considered an orphan in Greece. The story begins with loving parents and their daughter. The mother caters to the daughter's every need. Then suddenly she dies and the girl becomes an orphan in Greek terms. The father remarries a woman with two daughters. The woman is mean to the orphan and even counts the drops of water she is allowed to drink. The mother spoils her own daughters and they are mean to the orphan as well. One day the orphan goes to her mother's grave crying and complaining about the stepmother and sisters. The mother's grave trembles and her voice is heard telling the daughter to go home and wait for her good fortune. The next morning when the orphan goes to do her chores, Mother Nature presents her with many gifts. She receives a wreath of the evening star, shoes from the ocean and dresses from the meadows as well as beauty and grace. She takes her gifts and hides them in a trunk. That Sunday, the prince decides to attend church at their local village church. The stepmother demands the father to have three dresses made for her daughters and herself to wear to church that week then asks for jewels for them all as well. She demands the orphan to do her daughters' hair in the latest style (high updos). Then they parade through the streets like royalty to church. The orphan bathes and cares for herself as her mother once did and then dresses in her gifts and she finds many gold coins in the bottom of the trunk. Instantly she shines like the sun and is as beautiful as the moon. She takes some of the gold coins with her. When she goes outside and reaches up a cloud becomes a white mare. She rides to the church and hears her mother's voice on the way telling her to return home as soon as the service ends or all is lost. She turns everyone's head as she enters the church. The prince is mesmerized by her. When the priest says the final "Amen" she leaves. The prince asks his guards to catch her and bring her to him. She throws the gold coins into the crowd and escapes. The prince inconsolable that week, but decides to return the following Sunday and tells his guards to have the beekeepers prepare some honey and wax for them to put on the step when the service is about to end. The morning goes the same and the orphan gets stuck in the honey and wax. She struggles and frees herself, but loses one of her tiny shoes. Again she throws gold coins in the crowd and loses the guards. The prince decrees that all the maidens of the village must come to the palace to try on the shoe. The stepsisters fret over what to wear and finally on the third day decide and they leave. The girl again dresses in her special way and this time takes the jewels her father bought for the stepmother and stepsisters for the first visit of the prince. As soon as she enters the palace the prince is mesmerized again and gets up to have her try on the shoe and of course it fits. She takes the jewels over to her stepmother and stepsisters and they realize who she is and how awful they have treated her and run away. The prince and orphan are married a few days later. In this version, I love how the magic come from Mother Nature. It reminds me of the star dress in The Salmon Princess. It also reminds me a bit of the Irish version, Fair, Brown and Trembling with the coins and mare. It is a lovely version and we truly enjoyed it.